the velvet bird: Fanciness Vintage and a giveaway! 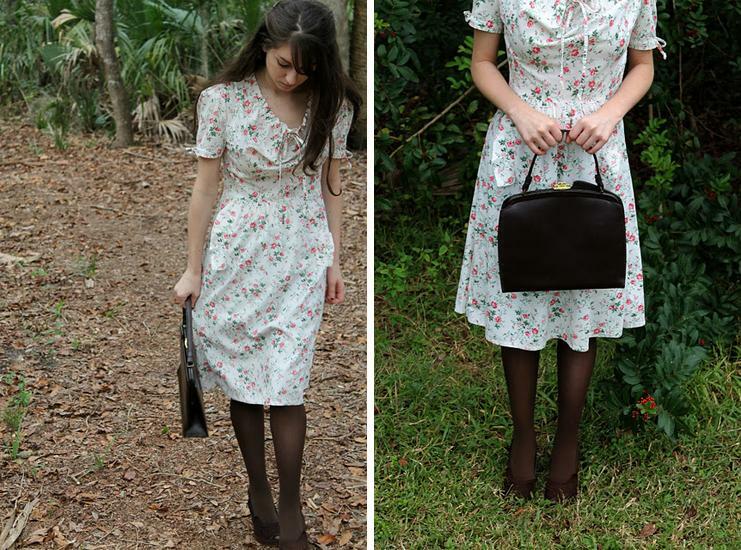 Fanciness Vintage and a giveaway! My friends! Here is a little giveaway and mini interview with one of my wonderful sponsors, Cara from Fanciness Vintage. Her shop is just full of great pieces, I am thinking I need this coat for the winter weather. She also has a blog, isn't she the cutest girl ever? Cara answered a few questions for me and also has something extra special to give away! My name is Cara, I currently live in Florida with my four rescued kittens, Beatrix, Oliver, Henry, and Gus Gus, and I'm the shop proprietor of fanciness vintage. I like cold weather, fancy dresses, kittens (obvious), and Buster Keaton. When I'm not working on my shop, I spend most of my time digging around in antique shops and flea markets for pretty vintage treasures. I think the 1920s were magical. I like to play dress up in lace 1930s dresses in the early morning hours while listening to Ma Rainey and Bessie Smith on my record player. What inspired you to start your own shop? I've been shopping at thrift stores and antique shops since I was very young, I remember bringing home 1960s faux fur coats and 1940s heels when I was thirteen or fourteen. It really always felt like finding hidden treasures for me. I would continually bring home vintage clothing that was too big for me or not really my style, because I always knew that I eventually wanted to open up a little boutique of my own, so I was sort of 'squirreling away' all of these pieces until the time came when I would open my shop. As I got older, I realized you could have an online boutique of sorts, and it seemed like the perfect thing for me. What is the best part of running a shop and/or being involved with the online community? The best part of running a shop is working for myself. I love the freedom it allows. And also the fact that my job is to constantly shop and buy clothing doesn't hurt, either. I do also love the sense of community between vintage shop owners. I've met many wonderful people via Etsy and Twitter that I'd not have otherwise known. I typically start getting excited for the holidays in August or September, maybe sometimes July even, because I live in Florida where it's hot ALL THE TIME and when it's at its hottest the only thing I want to think about is cooler weather and drinking hot cocoa and bundling up in cardigans and tights and listening to jazzy Christmas classics. I don't necessarily have any specific holiday traditions, but I do like to bake a lot during the holidays. I also try to go to St. Augustine at least once every December, because they have a Nights of Lights thing going on- they cover the whole town in little white lights and have brass bands playing Christmas music in the town square. It's very quaint and nostalgic. 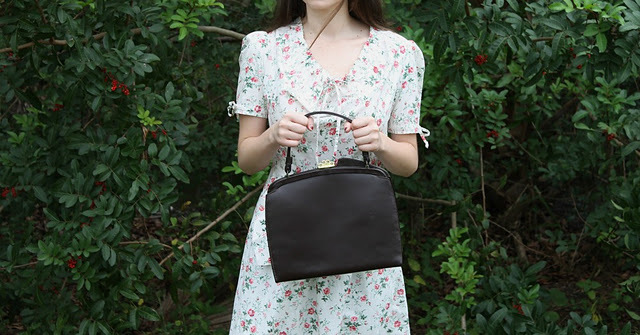 Win this brown 1950's handbag... thanks Cara! Be a follower of mine and Cara's blog, and then leave a comment telling us your favorite item from her shop. Good luck and giveaway is open until January 10th!! I have fallen in love with two items in Cara's shop. First, this little lace shift dress is so darling. And OH MY GOSH, these boots. I really might have to snag them before someone else does. I follow both blogs, and I think my wife would like the vintage 1950s wiggle dress II vintage 50s Bon Vivant black silk dress with soutache and rhinestone detail. Thank you for the chance. I follow your blog. I also follow Cara's blog. My favorite item is her shop is the vintage 1930s Oh Starry Sky black beaded French handbag. There are 2 pairs of gloves Im in love with as well! So happy I found this shop, someone was actually telling me about it the other day and I LOVE IT!! The red velvet 1950's dress, 1950's black lace party dress, and the 1950's swing coat are my favorites. I so wish I could exist in that era! Least there are still clothes around!! Ooh, I follow both of y'all's blogs (on Bloglovin') and I love the 1950's red velvet party dress! The light blue 60s maxi dress. So pretty! i follow both your blogs! and from her shop i love the vintage 1960s plaid jacket // vintage 60s cream navy and mustard plaid fitted jacket by koret of california!! i follow her on twitter (@sandyalamode)! i like fanciness vintage on facebook (sandy chang)! follow on twitter too. thanks to you both! Wow my favorite item would have to be the vintage 1920s white mary jane heels. SO pretty!